Host Committee includes: Catherine Petree, Hank Stampfl, Stephanie Mattera, Cris Longoria, Moises de la Renta, Sara Diorzaio, Michelle Moody-Stratton. 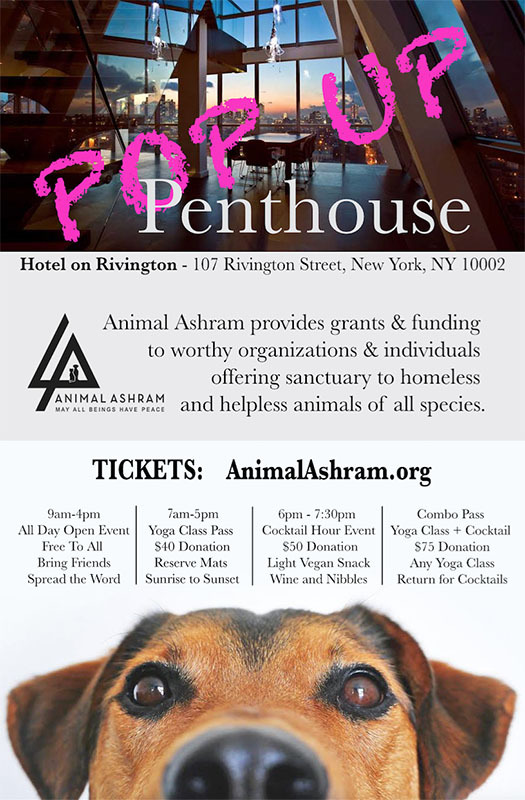 Sponsors include: Art by Sara DiOrazio, Luxary Faux Furs by Pelush, Animal Adoption by Animal Haven, Vegan Purses by Stacy Kessler, Zero Cruelty totes, satchels, cross-body bags, wallets and backpacks by GUNAS, Vegan Candles and Totes from boutique Presence of Piermont. 7am-5pm Yoga Class Passes ($40min) – reserve mats from sunrise to sunset. The event is being produced and designed by Hank Stampfl of Revel Rouge.